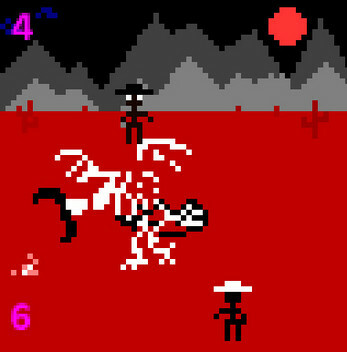 A two player game that is both about dead burnt cowboys trying to kill each other and not about that at all. 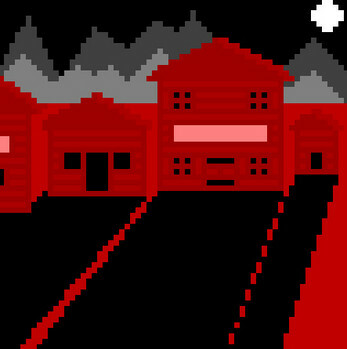 This is my first ever publicly available game and I'm making it for LowRez Jam 2016! (64 x 64 pixel games). It's a short game, though not as short as you might think. Or maybe it is? Life is full of mysteries. It's a little wonky, and that's in part to deciding to leave in some inexplicable but entertaining glitches. Player 1, you're at the top. A, S and D let you move left, shoot, and move right. Player 2, you're at the bottom. The Left, Up and Right arrow keys do the same for you. 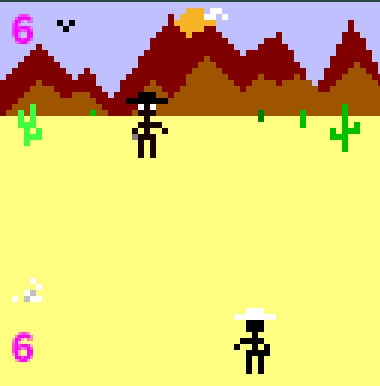 You both only have six bullets. Definitely more than one screen! Almost certainly at least one secret ending! Made with GAME MAKER! YEEHHAAWWW!!! Simply click the .exe to play. Easy peasy.